This might be a shocking revelation, but all too true in many parts of the world. In all aspects of life, we can make the ethical choice and choosing a tourist attraction that rescues and rehabilitates abused animals was mine. 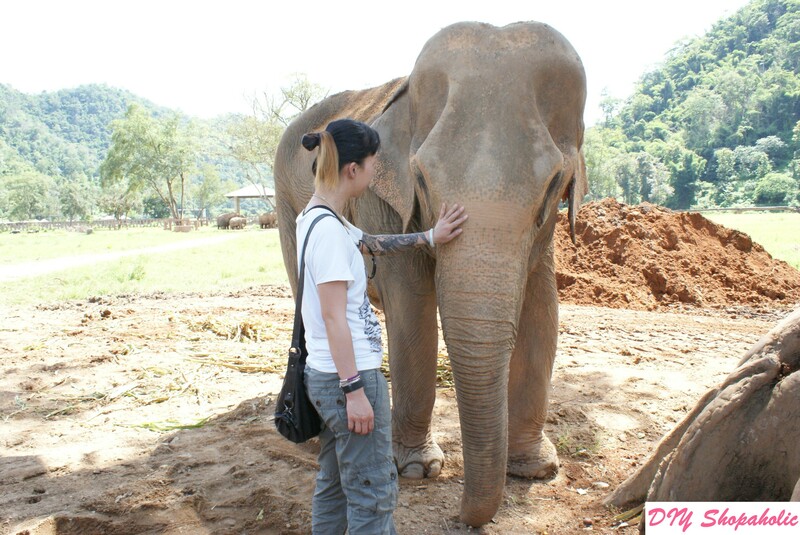 Here is my story visiting the Elephant Nature Park in Chiang Mai. Out of all the blog posts I’ve written, especially personal ones, this is one of the most difficult ones I’ve had to write. I find it difficult to expose my own personal thoughts to the world, but more importantly, this visit ended up being more intimate and affected me more profoundly than I thought it would have. It is also one of the most important messages I have to write and for this reason, I feel it is necessary to share this story with you. In most countries, wildlife encounter attractions are a dime a dozen, but most of the ones that are well promoted, especially those that offer selfies with a wild animal, watching them perform (in a show or demonstrating their abilities to paint) or a ride on the back of an elephant, will involve cruelty and abuse to animals (you can read more about these attractions here and here). The reason why these tourist attractions are so popular is because the wildlife animal is elusive to the human population, some dangerous predators, so to be able to come close to one is an exciting prospect. Would it still be so exciting to learn that no matter whether they are performing, giving rides or are staying still for selfies, they have been trained to do so out of fear and pain? Something that none of these attractions will ever admit is that most animals are taken away from their mothers, forcefully I might add, while they are still young. 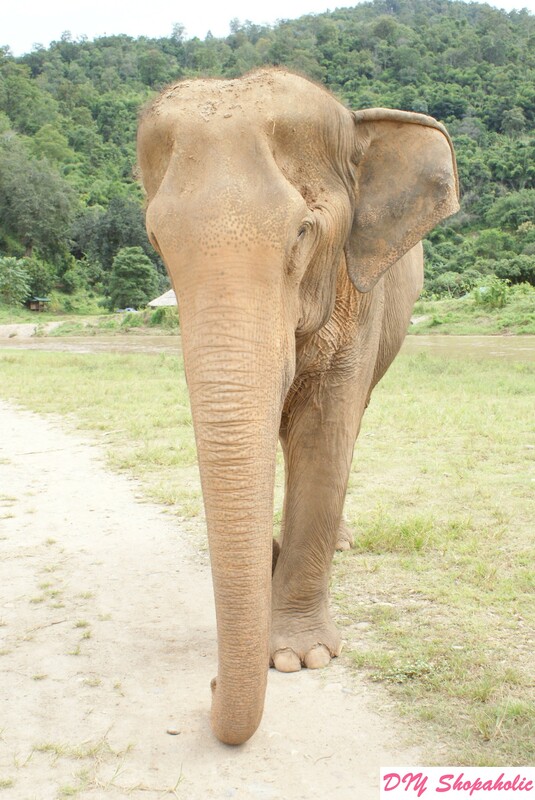 This causes them to rely on the humans through their difficult and abusive ‘training’ that is conducted out of sight of the general population, usually in deserted forests and woodlands, to obey the commands of their ‘trainer’ (or mahouts for elephants) and to fear punishment, pain or starvation if they don’t. 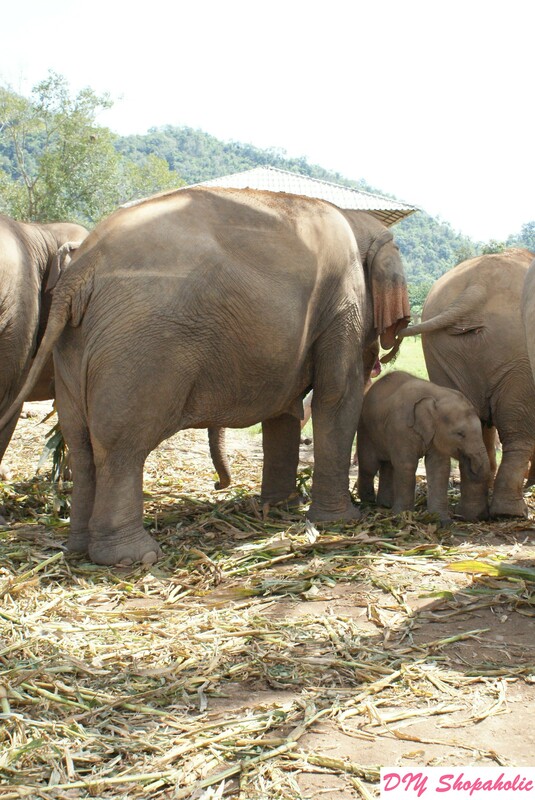 Knowing what I did, my mum, sister and I made the conscious choice to avoid the recommended attractions which employed abuse to visit rescued and rehabilitated elephants instead in the outer regions of the Chiang Mai province. 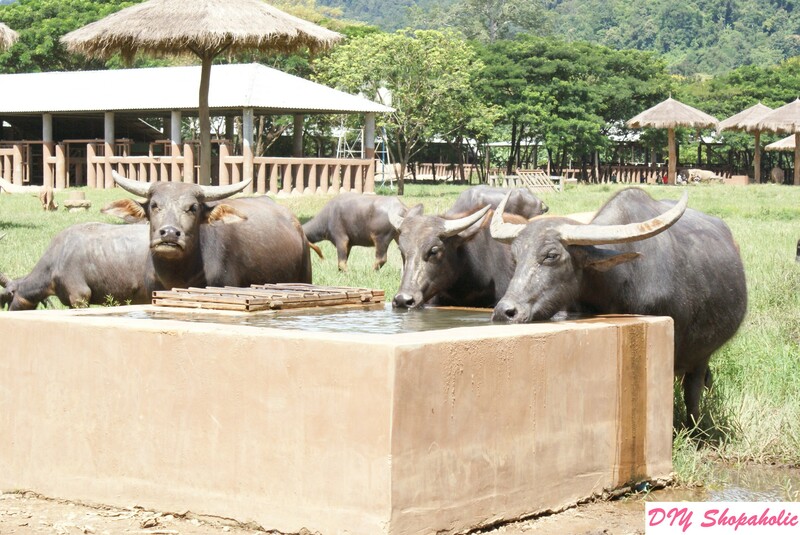 With over 200 acres of land for 69 elephants, water buffaloes, cats, dogs, horses, pigs and all other rescued species, the staff and volunteers are committed to providing security and safety these animals lacked in their former lives. Elephants were mostly previously used and abused either in the entertainment or logging industries while water buffaloes and other species such as pigs were rescued from the slaughterhouse. 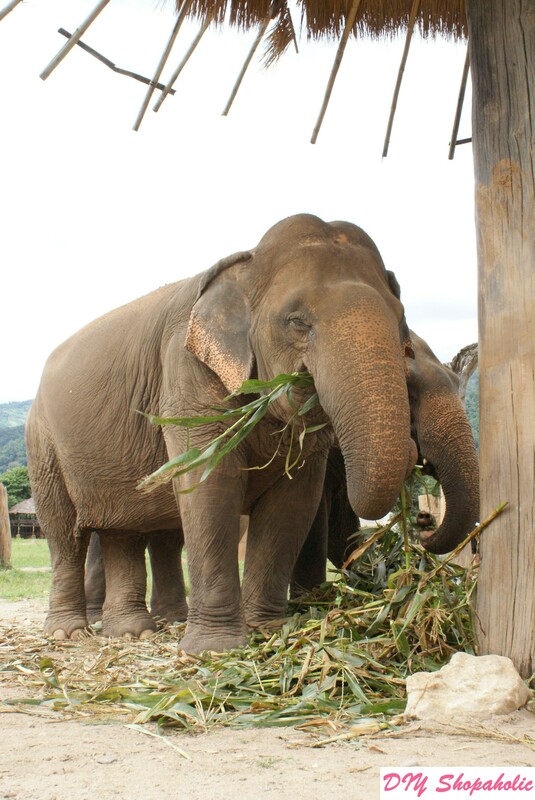 Elephants, as you can imagine, are large animals and consume a lot of food daily. It isn’t difficult to see why the higher cost for visitors are necessary. 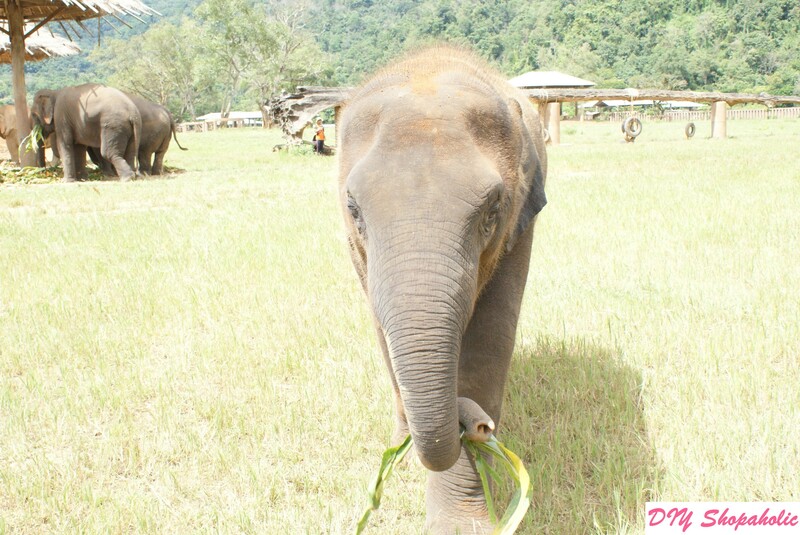 The price of the visit includes transport from your hotel within the city centre of Chiang Mai, vegetarian lunch (in respect of the animal rescue ethos of the park) and fresh fruit and vegetables for the elephants on the premise. Our tour guide, Prom, introduced us to the different pachyderm ladies, some of whom were sociable while others stayed far away from the human visitors and near their families instead. Almost all the elephants we saw that day have the same look in their eyes: full of pain and suffering. Some of the ones we’ve seen from afar seem much happier with their new families and freedom at the sanctuary, but for some they can’t forget the pain and abuse inflicted on them by their former mahouts. It saddens me to think these gentle giants would be abused so for greed and monetary gain. It was also heartwarming to see that there are elephant calves of different ages joining their mothers, aunties and grandmas in devouring their food. Female elephants are very protective of their babies and would come running to their aid at the slightlest sign of distress, so for our own safety we weren’t permitted to engage with them at all. One older calf was excited to approach us and kept trying to get visitors’ attention, but we could see a few of the females eyeing us from afar, so we had to disengage and walk away. The baby eventually walked back to his herd dejectedly without any fun to be had with the humans. We got to spend the whole day meeting different elephants, seeing the bull elephants in a separate enclosure (due to their more aggressive nature – one was throwing dirt and small rocks through the bars – we all had to keep a safe distance from their area). From the morning, we visited different areas of the park where different herds of elephants were eating or relaxing. We were also shown the area new elephants are brought to give them the solitude they need. Elephants are social animals and should be given the choice to choose their own herds, but you can imagine when they’re being used to carry heavy logs or performing to cheering and mesmerised children, this isn’t always possible for them to stick together. 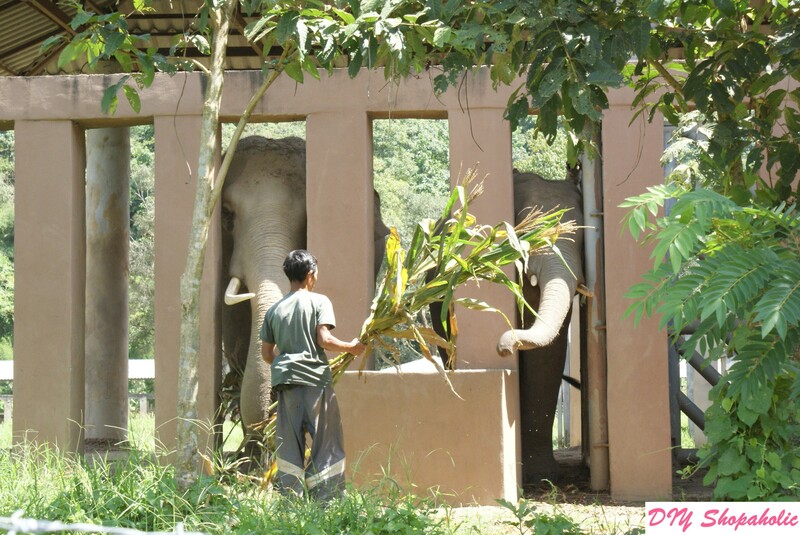 The fact that they choose not to approach other elephants is something the Elephant Nature Park feels is necessary for their rehabilitation. When one is abused, even humans, we don’t necessarily feel like socialising immediately after rescue. The elephants are accompanied by their mahout at all times to ensure their safety and welfare, but whether they approach others in the park is their own choice and on their own terms. When they feel the need to reach out, they will approach other elephants to find and join their own herd. I had a very profound moment when Prom told us about one elephant who was blind in one eye. 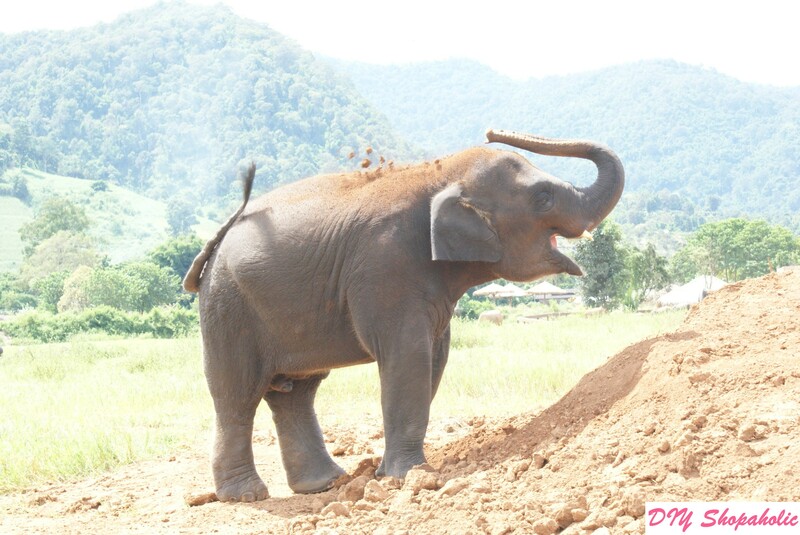 She was worked hard while pregnant as a logging elephant and gave birth prematurely, sadly the baby didn’t survive. 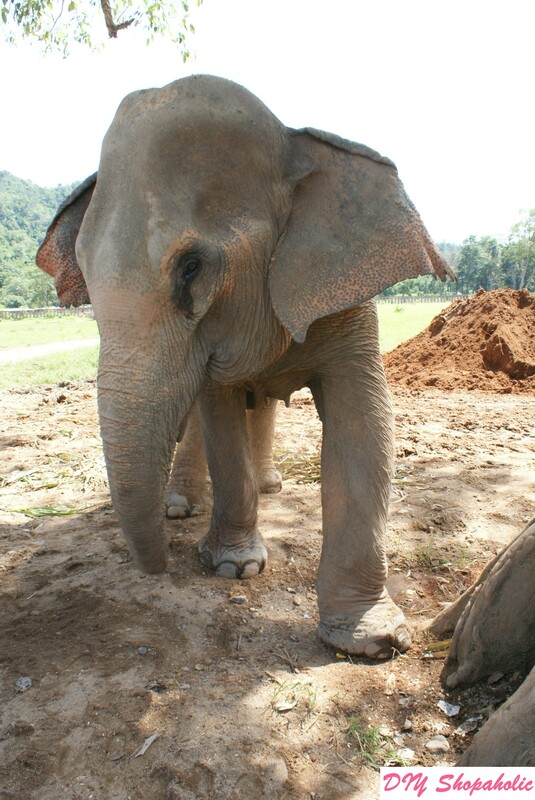 While dealing with her grief and post-partum depression, her mahout wouldn’t let her near her deceased calf and in her anger she broke his arm. He retaliated by blinding her. Another female had her ear amputated due to an infection. Prom invited us to approach her and when I did, I couldn’t help but feel empathy and sorrow for pain she held within her eyes. They say the eyes are the window to the soul, and this couldn’t be further from the truth for this lovely lady. How a pair of eyes can hold so much sadness and grief in them is enough to make any person stumble. There was no need for words between us. The minute our eyes met, she knew I was empathising with her and she started to walk beside me as we went back to the main building. 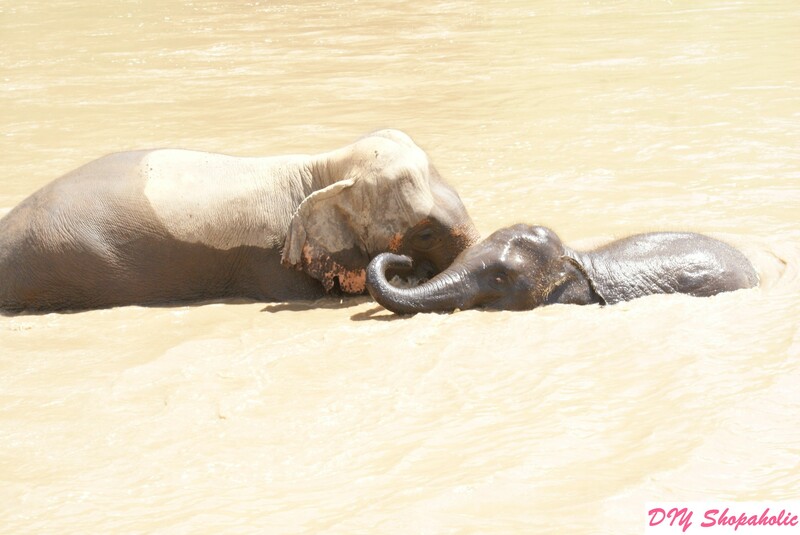 One of the more fun parts of our interactions with these gentle giants was bath time. 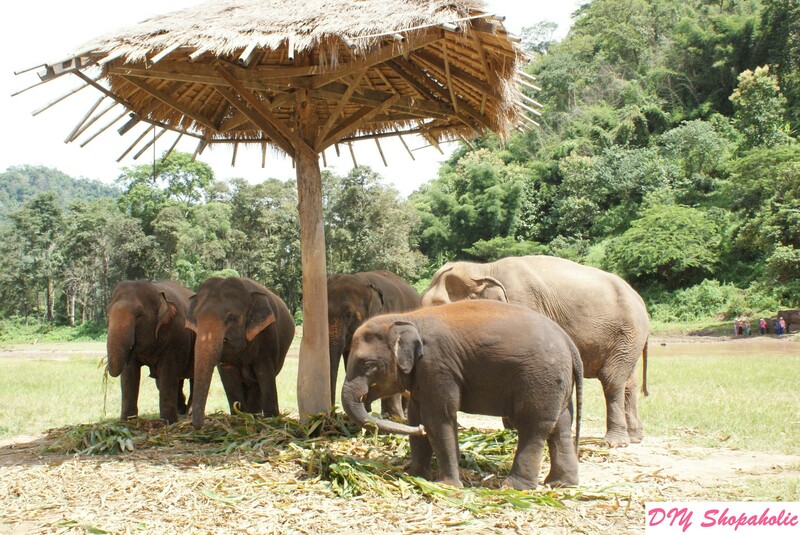 Anyone who wanted to help bathe the elephants were told to bring a spare set of clothes, a towel and sandals or flip flops. The elephant we were assigned was happily munching away, first from the back of the truck filled with baskets but then grudgingly accepted the sole basket she was assigned when the truck drove away. The most important part about encounters with wildlife animals is to respect their natural habitats and to interact with them in the way that would be acceptable to them. We wouldn’t be happy if we were separated from our family and friends and forced to perform tricks that’s not natural for us daily to screaming and loud crowds, why do we think this would be acceptable for animals? They are not thoughtless and emotionless beings, they also have feelings and memories as living beings. I encourage everyone to research the attractions they plan to visit and to consider whether they would support an activity that involves abuse. If the answer is no, please walk away and make the ethical choice. Elephants are already in danger of poachers (see Leonardo DiCaprio’s efforts to protect elephants from poachers here), would we want to destroy their trust in humanity? Instead of abusing animals for our own entertainment, we should be living in harmony beside each other and protecting these vulnerable beings. 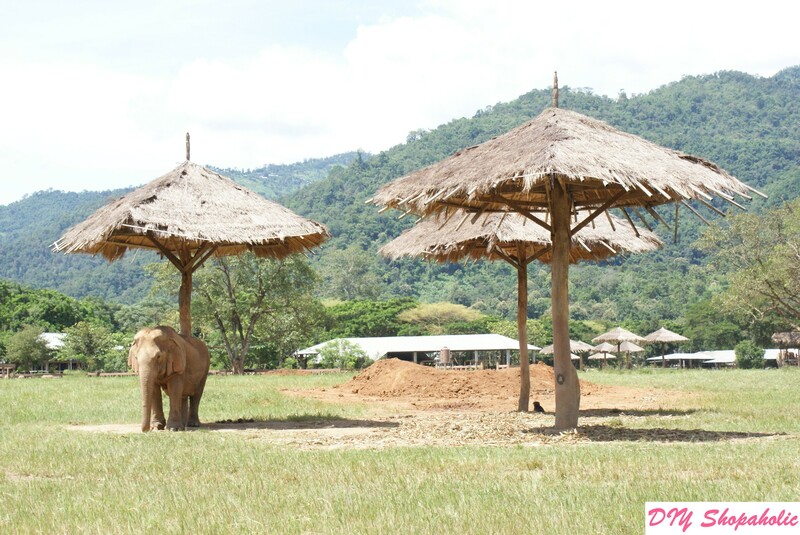 For more information on the work of the Elephant Nature Park, to volunteer or different visits, visit their website to book your place here. 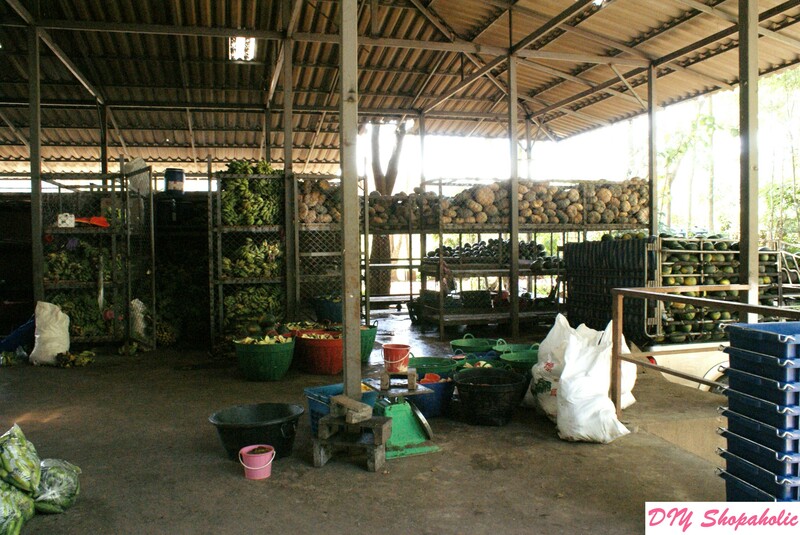 Do you know of any other ethical tourist attractions, in Thailand or around the world? If so, I would love to hear from you! I like to travel and knowing about ethical, animal welfare sanctuaries that are open to visitors, so please leave a comment below!